Can a religious Jew embrace modernity? 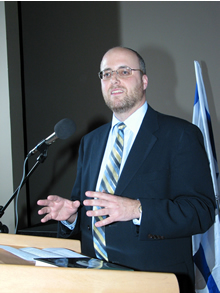 JERUSALEM (March 3, 2005)--Rabbi Jeffrey Saks does not seem like the kind of person who would set out to revolutionize Orthodox Jewish education around the world. He is only 36 and looks even younger; his beard is short and trimmed, and he was not raised in a bastion of Orthodoxy like Jerusalem or the New Jersey communities in Lakewood, Teaneck, or Highland Park--or even in an Orthodox home. Saks grew up in a nonobservant home in Roselle. He became hooked on Orthodox Judaism in high school by attending the late Rabbi Steven Dworken’s Anshe Chesed synagogue in Linden and social events organized by the Orthodox Union’s National Conference of Synagogue Youth. Now Saks lives with his wife and two children in the West Bank city of Efrat, a Modern Orthodox community located 20 minutes outside Jerusalem. But perhaps this journey from a secular background to an Orthodox one makes Saks uniquely qualified to lead an effort to ensure that both names in the appellation “Modern Orthodox” retain their meaning. Saks is the founding director of ATID--The Academy for Torah Initiatives and Directions--which hopes to train a new generation of Orthodox educators for an increasingly polarized Jewish world. Established in 1998, ATID came along at a time when the central tenet of Modern Orthodoxy--a life of Torah that fully engages with the secular culture--was being challenged by its own right wing. Meanwhile, religious Zionists in Israel were being buffeted by a peace process that challenged their relationship to biblical lands beyond Israel’s Green Line. ATID (Hebrew for “future”) tackles problems of faith, how to make both prayer and secular studies meaningful, drug abuse in Orthodox schools, ways to advance art in Jewish education, and the educational challenges and opportunities of Israel as a Jewish and democratic state. At the seventh annual ATID conference in Jerusalem on Feb. 16, a panel of educators examined how to bridge the gap between two opposite trends in Orthodox Judaism: strict, unemotional adherence to Jewish law and a renewed interest in spirituality, mysticism, and enthusiastic prayer. In his keynote address, Rabbi Jacob Schacter, dean of the Joseph B. Soloveitchik Institute, emphasized the importance of feeling God’s presence in daily life. The panelists agreed that intellect and emotion must work together but are instead pulling people apart in extreme approaches. Interviewed the next day at ATID’s modest office in the capital, just a few buildings away from both the official residence of Israeli President Moshe Katsav and the Jerusalem Theater, Saks acknowledged that ATID is tackling issues that have been swept under the carpet by the Orthodox community for decades. After graduating high school and adopting Orthodoxy as his way of life, Saks attended the Hamivtar yeshiva in Efrat and Yeshiva University in New York, where he received his rabbinical ordination. He taught at YU’s Central High School for girls before making aliya in 1994. Following three years as Hamivtar’s educational director, Saks became a Jerusalem Fellow in a prestigious program for senior Jewish educators from around the world and all religious streams. During the fellowship, he set up ATID together with Rabbi Chaim Brovender, the dean of Hamivtar, where beginners learn Torah. Brovender also founded Michlelet Bruria, perhaps the first Orthodox institution to offer women in-depth textual study and Talmud. The goal of ATID from the outset has been to shape the future of educational leadership in the Orthodox community. ATID accomplishes that lofty goal with five primary programs: the two-year ATID in-service training fellowships for teachers and future educational leaders; ATUDA Fellows for students preparing for careers in Jewish education; laboratory programs for school reform; community conferences; and publications. Saks said that his own teaching experience made him realize that teachers have too few opportunities to learn from their peers. That problem is compounded for educators in Orthodox schools, who try to teach a way of life along with the daily curriculum. Saks said that most problems in Orthodox education are the same in Israel and America, but there are some that are unique to one or the other. For instance, American schools face a challenge retaining qualified teachers outside metropolitan areas; in Israel, religious Zionist teachers in Israel who believe in a Greater Israel have to find a way to deal responsibly with the philosophical crisis arising out of Prime Minister Ariel Sharon’s plan to dismantle settlements in the Gaza Strip. “Constructing a meaningful Jewish identity is different in Israel, where it’s very much a part of society than [in the Diaspora], where it must be painfully constructed,” Saks said. ATID’s first major school reform project is taking place at the AMIT Noga girls’ high school outside the city of Beit Shemesh, halfway between Jerusalem and Tel Aviv. The school is testing a policy proposed by ATID fellows that would offer Jewish studies in a beit midrash (independent learning) setting instead of in classrooms. The theory behind the experiment is that typical classroom education can be stifling and uninspiring because it forces a diverse student body to study the same material at the same pace. The beit midrash model, around which Torah learning has been centered for centuries, allows students to pursue broad areas of interest with more intellectual freedom and independence. The Noga school project could be used as a model for Orthodox schools in Israel and the United States. ATID has also conducted smaller programs in Israel, England, and the Moriah School in Englewood, NJ. Saks and other ATID staff went to Moriah to initiate the program in 2001, and 15 Moriah teachers came to Israel for ATID seminars on how to teach prayer and spirituality. ATID has only four full-time staff members, but they work with a diverse team of fellows, mentors, and project directors from yeshivas, academia, primary and secondary schools, and informal education. “These worlds often don’t interact in a meaningful way to seriously address the issues facing Torah education, but at ATID, this combination has been very rich and helped set our agenda,” Saks said. This eclectic approach is captured in the title of a book of essays compiled by Saks with Bar-Ilan University English professor Susan Handelman: Wisdom From All My Teachers: Challenges and Initiatives in Contemporary Torah Education (Urim Publications). Saks said that his background and his familiarity with other approaches to Judaism help him appreciate what Orthodoxy has to offer. Copyright 2005 New Jersey Jewish News. All rights reserved.